Munich - Rub your eyes all you want, they are not deceiving you: FC Bayern München really did lose 2-0 at home to Borussia Mönchengladbach on Matchday 26. Yet as unlikely as a Gladbach victory may have seemed at the outset, it was perhaps not entirely surprising once was forced off the field in the 24th minute with an abdominal strain. Indeed, without the Dutchman and his fellow wing-wizard Franck Ribery, Bayern are a rather different proposition. Pep Guardiola’s charges dominated against Gladbach, enjoying 65 per cent possession throughout the 90 minutes and mustering 16 attempts on goal compared to their visitors’ four. Yet the only time the hosts seriously, and consistently, threatened to break through Gladbach’s stubborn resistance was in that opening period when Robben was on the pitch. His pace, ball control and directness caused the Foals problems early on and he set up Robert Lewandowski for the first chance of the match in the fourth minute. 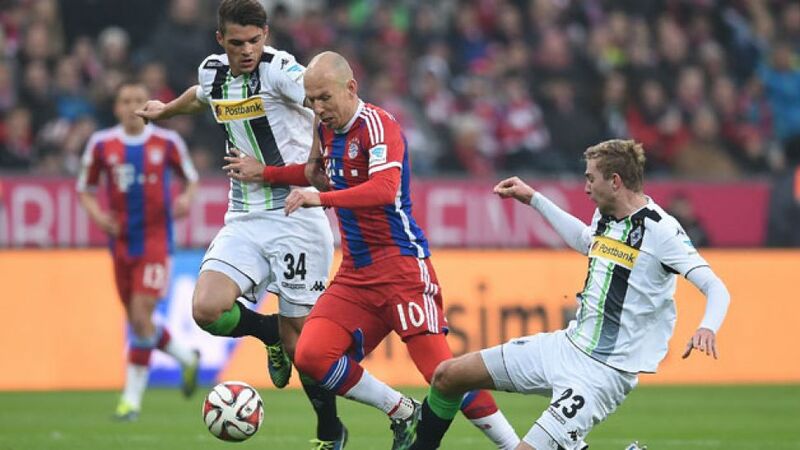 Patrick Herrmann, who set up Gladbach’s opener, added: “Robben is a world-class player, there’s no two ways about it. It certainly didn’t hurt our chances when he had to go off.” A glance at the statistics offers support for Herrmann’s claim. Bayern have won all 12 Bundesliga assignments this season in which both Robben and Ribery were on the pitch, scoring a total of 41 goals and conceding just four. Between them, ‘Robbery’ have been directly involved - by either scoring or providing the assist - in 36 of Bayern’s 70 league goals this term: a staggering 51 per cent of the total. Furthermore, Bayern’s results suffer when the duo are not on the pitch together. When that has been the case this season, the Bavarians have won eight, drawn four and lost two. And while Bayern average three points per game when both are playing, they slump to 1.8 points per match when at least one of them is absent. The upshot, then, is clear: Bayern score fewer goals and win fewer games when Robben and Ribery aren’t playing. The international break could therefore not have arrived at a better time for Bayern, allowing the duo a fortnight's recovery without them missing any additional matches. With Guardiola’s men due to face Borussia Dortmund at the Signal Iduna Park on Matchday 27, the league leaders will need ‘Robbery’ more than ever once the action resumes in April.